Kirk Bell August 8, 2018 Comment Now! It is an easy run for this motor from the dark beyond as it pushes me back into the super-size me sport seat while a red-eyed Hellcat logo embroidered into the flat seatback stares a hole into the back of my helmet. These seats are the antithesis of the tight Recaros you’ll find in a Ford Mustang. While those seats pinch wider backsides, these leave room for American builds. Skinny folks will slide side to side during aggressive cornering. The engine growls with the fury of a NASCAR stocker while its supercharger whines and whistles like a jet upon takeoff during the climb. This is the Demon engine with 7 fewer horses than that car had on pump gas, and the supercharger is the largest ever installed on a factory engine. 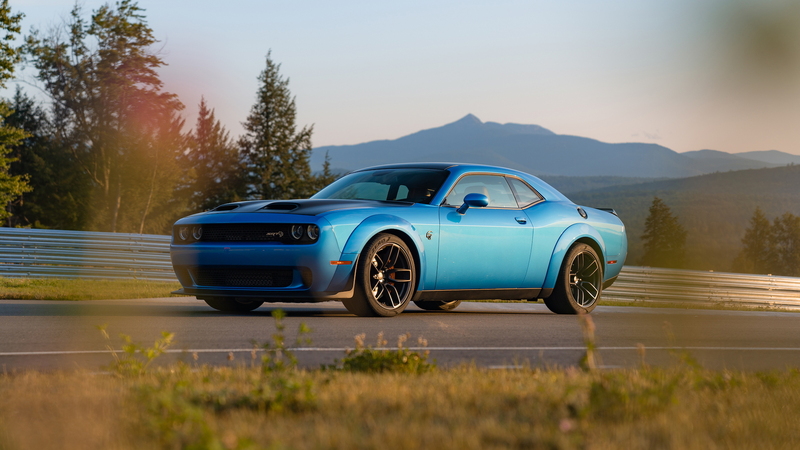 Compared to the regular Hellcat, it spins up 2.7 liters of air for every revolution instead of 2.4 liters and creates 14.5 psi of boost versus 11.6. Dodge adds a second dual-stage fuel pump to dump fuel into the cylinders because when you pack an engine with air it also needs more fuel. The result is an astonishing 797 horsepower and 707 pound-feet of torque. Up front, the V-8 breathes through a new dual-snorkel hood, gathering in more air the faster I can push the car. The hood seals to an airbox below it, provides a ram-air effect, and lowers the air intake temperature by 4 degrees. That hood is also responsible for the 7 horsepower drop versus the Demon. It lets in lots of air, but it’s slightly more restrictive than the Demon’s hood. The reason? The Redeye can go 203 mph, while the Demon topped out at 168 mph, and Dodge had to restrict the airflow because the larger intakes on the Demon’s hood would have created lift at the Redeye’s higher top speed. The airbox takes air from two other sources as I wind my way around this scenic track. The familiar “Air Catcher” headlamp from other SRTs, essentially a hole where a second headlight would be on the driver’s side, is one source, and an inlet near the wheel liner is the other. 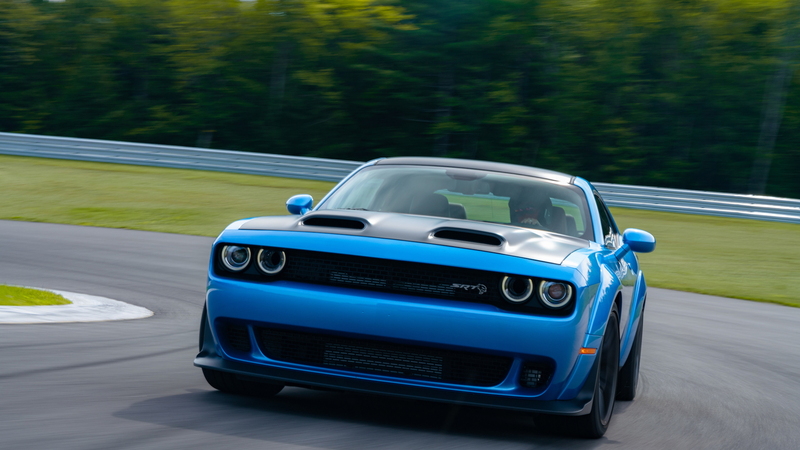 Together, these sources bring in 18 percent more air than last year’s 707-horsepower Hellcat. I’m running in the Custom mode, with the transmission, suspension, and steering in the Track settings, but the traction/stability control in the Street setting. Sure enough, the shifts may come quicker in Track, but I prefer the smoother shifts of Sport for this track, and it holds the gears plenty long enough to provide lots of power out of corners. The Track setting is better for drag racing where hard shifts won’t affect balance. Surprisingly, I’m not annoyed by the Street setting for the stability control. It doesn’t kick in to cut power or get me back on line, even as I push the car pretty hard. To be fair, I make sure to show the car the respect it deserves by going easy on the throttle out of corners. In the one instance when I get on the gas a bit too early, the rear end steps out for a second. I ease up and it falls back in line. I provide the stability control, so it doesn’t have to and it doesn’t cut the power on me even with that misstep. Most systems would. “Our full on is like a lot of Sport modes,” Heuschele explains. The Hellcat Redeye weighs in at a cruiserweight 4,492 pounds, so it’s not ideal for the track’s downhill braking zones. Club Motorsports has 250 feet of elevation change, and with multiple hills the car must face 700 feet of climbs and descents on this roller coaster. Dodge outfits the Hellcat Redeye with big Brembo brakes to take on all that weight and all that speed. Up front it has two-piece vented and slotted 15.4-inch rotors with six-piston calipers and out back the vented and slotted rotors are 13.8 inches in diameter and clamped down upon by four-piston calipers. The SRT guys added extra brake cooling to deal with the Redeye’s ludicrous speeds. The binders do their job on this 2.5-mile course, but Dodge isn’t exactly letting us give them the toughest workout. Our sessions include one out lap during which I’m scolded for “going too fast,” a hot lap, and a cool-down lap at 50 mph or so. With an instructor and me in the car, the Brembos arrest the motion of nearly 5,000 pounds of American iron and beef without pulsating or fading, though the braking distances feel too long on occasion when the speeds rise up around 130 mph or the downward pitch becomes steep. The 2 and a quarter tons of weight also isn’t good for cornering, but I’m in the Redeye Widebody, which is better prepared for cornering than any pre-Demon Challenger. 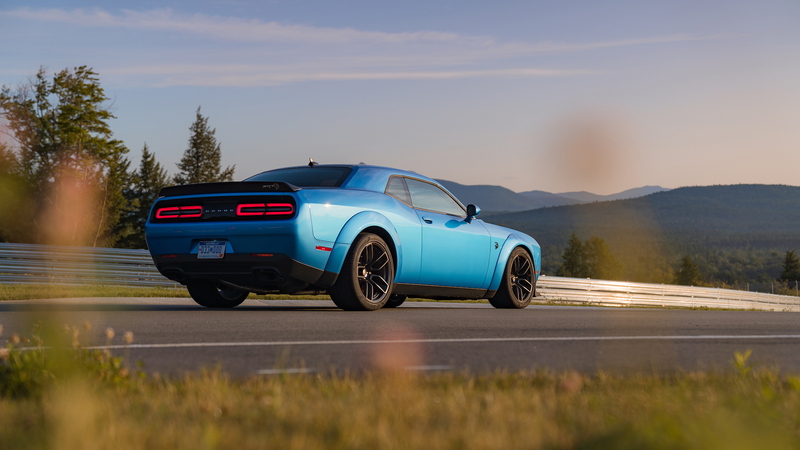 It’s 3.5 inches wider than the now so-called narrow body Challenger, with a track that measures a rather healthy 65.6 inches up front and 65.7 inches in the rear. Tacked on wheel flares make room for massive 305/30R20 Pirelli P-Zero tires at all four corners. Those tires make all the difference. They help put all that power to the pavement in a straight line and out of the corners on this track. 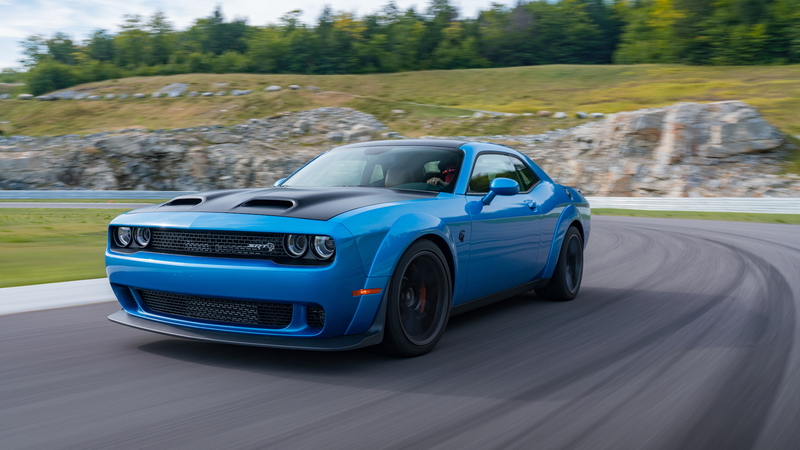 That allows the Hellcat Redeye Widebody to fire off a 0-60 mph run of just 3.4 seconds. While that’s only a tenth of a second quicker than a narrow body car, mortal drivers like you, me, and the mailman will come closer to reproducing that number, as well as the 10.8-second quarter-mile time. Sure, NHRA drag racer Leah Pritchett can control the wheelspin of the 275s on the narrow body car to put up its ultimate performance figures (3.5 0-60, 11.1 quarter mile), but us three would have a tough time hitting those numbers. The wider Pirellis also do a better job of biting into the pavement on this flowing road course. If I get my braking done, plant the nose, and ease into the throttle at the apex of any given corner, the Redeye’s handling is actually fairly neutral. At that point, I can play with the balance with the throttle: push it a bit too hard and it will understeer on these long sweepers, stab it and the rear end will come out—that’s what you get with 800 horses from the underworld. It may be nose heavy with its 57/43 front/rear weight balance, but Dodge has tuned the Hellcat Redeye to make it agile and driftable. From the driver’s seat, I feel more lean than I’ll ever get in a Chevy Camaro or Ford Mustang. That’s because the seating position is quite bit higher than those now far sportier and track-focused cars. It’s probably about as high as a late 1990s Mercedes-Benz E-Class. The steering has a lot of heft to it, too, especially in Track mode, but that provides welcome stability in these sweepers. A run on the road reveals the adaptive dampers provide a softer, more comfortable ride than the Camaro/Mustang duo. Dodge charges $6,000 for the Widebody and $72,745 for the 2019 Challenger SRT Hellcat Redeye, which includes a $1,700 gas-guzzler tax and a $1,395 destination charge. That brings the total to $78,745. That’s a big number, but this a car that’s all about big numbers, and some of those numbers—797, 3.4, 10.8, 3.5, 203—make this the best version of an American muscle icon yet. Dodge provided travel and lodging to Internet Brands Automotive to bring you this firsthand report.